This tutorial will show how to map multiple VMeters in Reason to any knob or fader. This tutorial is done on a Mac OS X. If you're using Windows 7, you'll likely need to configure the VMeters to use different channels. 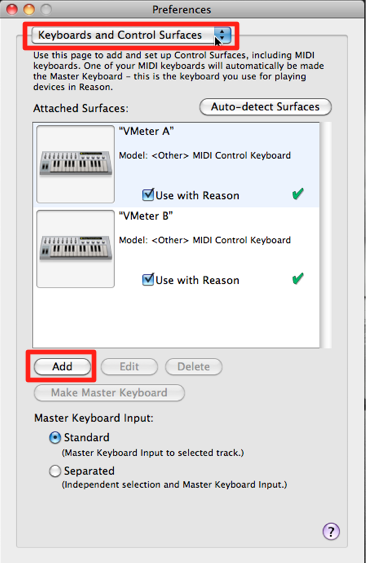 Select "Keyboards and Control Surfaces"
Next, choose < other > for manufacturer and "MIDI Control Keyboard" for model. Type in a nickname for the controller--we typed "VMeter A"
Finally, choose one of the VMeters. 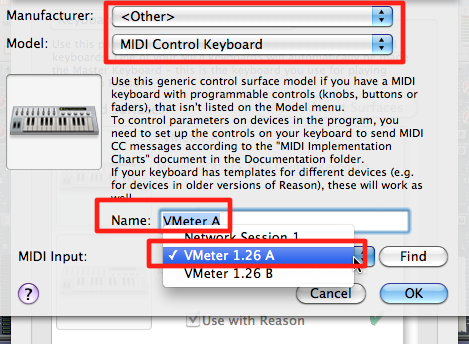 In this example, we've configured one VMeter for MIDI channel 1, and the other for MIDI channel 2. This causes their names to appear as A and B (only with latest firmware, and after deleting any pre-existing devices from the OS X Audio MIDI Setup). You shouldn't need to set the VMeters up on separate channels on OS X--Reason can differentiate. This isn't always the case, though, with other software. As noted at the top of this tutorial, in Windows 7, you will likely need to configure each VMeter to use a different MIDI channel. Repeat this process for the other VMeter. 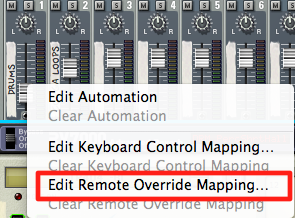 Ctrl-Click (right click) any knob or fader you'd like to map to a VMeter. 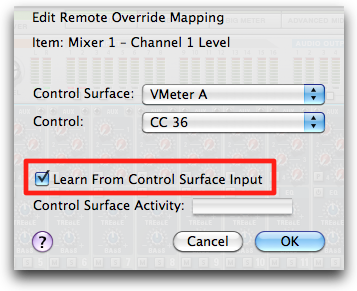 Click "Edit Remote Override Mapping..."
Click "Learn From Control Surface Input"
It should automatically detect the correct VMeter and controller number output. Repeat this for the other VMeter, and that's it! If you'd like to use multiple outputs on one VMeter, for instance, the position and pressure output, the Learn process in Reason may always detect one output over the other. In this case, you can also manually set the Controller number in the reason instead of using the "Learn from Control Surface Input" box.